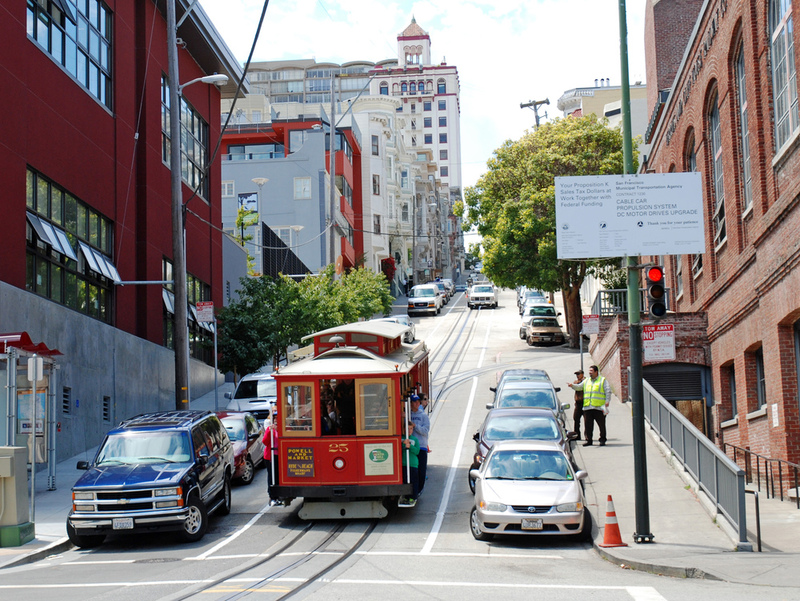 A cable car (it is San Francisco after all) is next seen clanging down a steep hill. Then ... This is Washington Street near Mason looking up two blocks to Jones (map). The structure on the right is the cable car museum and the building at the top of the hill is the 1360 Jones apartments (incidentally, the roof of which was used to take a view across the city in the movie Lady From Shanghai). ... and Now, the corner building on the left and the railing on the right are recent additions but all else, including the cable car, is as it was. It's reassuring to see that San Francisco drivers still know how to curb their wheels. The police have put the word out about a bandage found near the sniper's 4th victim. Below, a man on the cable car reads the article in his newspaper out loud and is overheard by Miller's workplace supervisor (Geraldine Carr) who realises that her introverted employee may be the killer - she has seen him with a bandaged hand. She jumps off the cable car at the next stop to look for a telephone. Then ... She crosses Powell at the junction with Washington, finds a phone and reports her suspicions to the police.